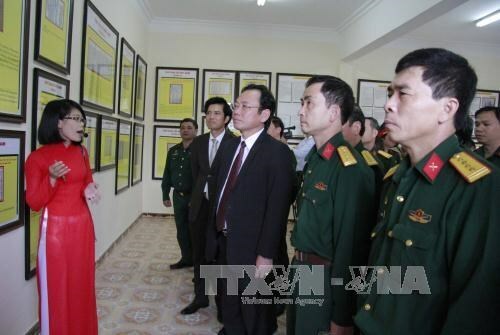 Lam Dong (VNA) - An exhibition of historical evidence proving Vietnam’s sovereignty over Hoang Sa (Paracel) and Truong Sa (Spratly) archipelagos opened in Da Lat city, the Central Highlands province of Lam Dong on June 21. The event is jointly held by the Ministry of Information and Communication (MIC), and the Da Lat Academy of Ground Force. On display are numerous documents and around 130 pictures, maps and publications of scholars, researchers both home and aboard. Especially, a collection of 19 royal documents from the Nguyen Dynasty from the 17 th to the outset of the 20 th century (1820-1945), reflecting Vietnam’s continuous and legal sovereignty over these islands. The event contributes to increase people and Vietnamese Overseas’ awareness of solidarity, the country’s inviolable sovereignty over the two archipelagos and its stance on protection of sea and island sovereignty.